Although we know the benefits offered by budget-friendly green ideas, it is no secret that sometimes cost and convenience trump green living. However, the introduction of products, recycling programs, appliances, and waste disposal alternatives that are eco-friendly has made it easier for families to make ecological choices. In addition to being less expensive and economical, green ideas can earn you extra cash. Applying green living tips to your bedroom is not a fad but one of the healthiest ways of decorating. Below are bedroom ideas that will ensure frugal families keep up the green fight. Because we spend lots of time in our bedrooms at night, air quality is of vital importance. Using HEPA filters in your vacuums and incorporating operable windows for cross ventilation is recommended. Apart from natural ventilation, you can save on energy bills by getting a stylish ceiling fan for the circulation of hot and cool air. In addition to washing your beddings weekly to cut down on the accumulation of mold, mildew, and dust-mite, it’s best not to use down pillows and comforters if you are prone to allergies. Consider hypoallergenic and organic options instead, most of which are filled with cotton, wool, buckwheat, kapok, millet hulls, and shredded latex. Mattresses are a staple in most bedrooms. Many people would invest in a good mattress to ensure a good night sleep. But because every item brought into your home has the potential to off-gas, it’s important to consider what your bed is made of before making a purchase. Opt for mattresses that do not contain polyurethane foam or fire-retardants, and are toxin-free. You may want to get mattresses that pass the fire tests set by the U.S. Consumer Product Safety Commission. Because of their natural fire-retardant qualities, you should consider organic wool mattresses. Green options such as mattresses filled with wool or cotton are as comfortable as chemical-filled mattresses. Using natural, untreated solid-wood box springs to supplement your mattresses is one of the most eco-friendly room ideas, especially if they are made from FSC-certified wood. You can make the lighting in your bedroom eco-friendly, at least regarding the fixtures used. For example, you can use old plastic bottles to craft pendant lights or a modern chandelier. Plastic bags create an effect that is almost the same as glass, making them efficient in creating unique light effects in your bedroom. You can also use plastic bottles to make decorative pieces for your bedroom. For instance, plastic bottles used in the structural design of a bedside lamp can create a charming accent. Organic linens include pillowcases and sheets made from fibers produced without the use of genetic engineering or synthetic pesticides. Remember, although organic is still preferable for your health, this does not necessarily mean it is eco-friendly, at least not in the holistic sense. Bed sheets are usually treated with formaldehyde, which is a known carcinogen, to make them soft. Choose chemical-free options such as organic cotton or bamboo bed sheets. Buying organic beddings is ideal because the cotton industry utilizes a quarter of the pesticides consumed worldwide. As you probably know, recycling is not only inexpensive but also environmentally friendly. When it comes to options for your bedroom furniture, making contemporary pieces from wooden pallets is one of the most eco-friendly room ideas. You can paint the wood in different colors to make the overall design of your bedroom furniture a lot more cheerful and attractive. You could use wooden pallets to build your bed, and then decorate it with bright patterns. You can also create a hanging rack for your hats, belts, and scarfs from wooden pallets or wall shelves from recycled wood and paint it with your desired shade. Using recycled wood allows you to enhance both the functional and aesthetic value of your bedroom. Frugal families should not let toxins and harmful chemicals take them lying down. Apart from being the most recommended, painting is also among the most popular and cost-effective methods of sprucing up the interiors of your home. Some years back, eco-friendly paints and primers are costly. But nowadays, low or zero VOC paints are readily available at reasonable price. Because they emit little or no odor, such paints are safer to use. Some options are available at a very low price point even though they come with a 25-year warranty. Conventional paints covered with a similar warranty usually cost twice the amount. Make sure you choose low or zero VOC paints and stains for your bedroom walls, ceiling, and furniture. When it comes to replacing your floor, you need to remember that apart from the production of formaldehyde gasses, carpeting has to be replaced every seven years on average. Installing a renewable wood flooring like cork or bamboo might be more expensive initially. However, this option can save you a lot of money in the long run. What’s more, they will only require refinishing over the years. When it comes to budget-friendly green ideas for your bedroom, laminate flooring is a viable option if wood is entirely out of your budget. Laminate flooring lasts much longer than wall-to-wall carpeting. And unlike carpets and padding, laminate floors do not hold in dirt and pollutants. Instead of purchasing a new bedroom set, throw in some creativity with what you already own. Decorating your home in an eco-friendly fashion shouldn’t be expensive, especially since you probably have many of the required items already. Check for items that you can repurpose, keeping an eye out for those that you love. Apart from reducing the need for lumber or volatile paints and glues, repurposing saves items from the landfills and recycles them as useful objects. For instance, you can use a fallen tree trunk or stack of old luggage as a nightstand. You should try to recycle materials as you craft for your bedroom. The brown bag floor is one of the most favorite green living tips. You could use recycled brown paper bags to paper your bedroom floor, designing it to look like stained concrete or stone. You can also use gift paper and tissue to decoupage your jewelry box, cardboard boxes covered with scrap fabric as stylish storage options, or bright colored magazine pages to create terrific paper art ornaments. Save gas and support green living by shopping at local thrift stores, architectural salvage stores, and antique shops. 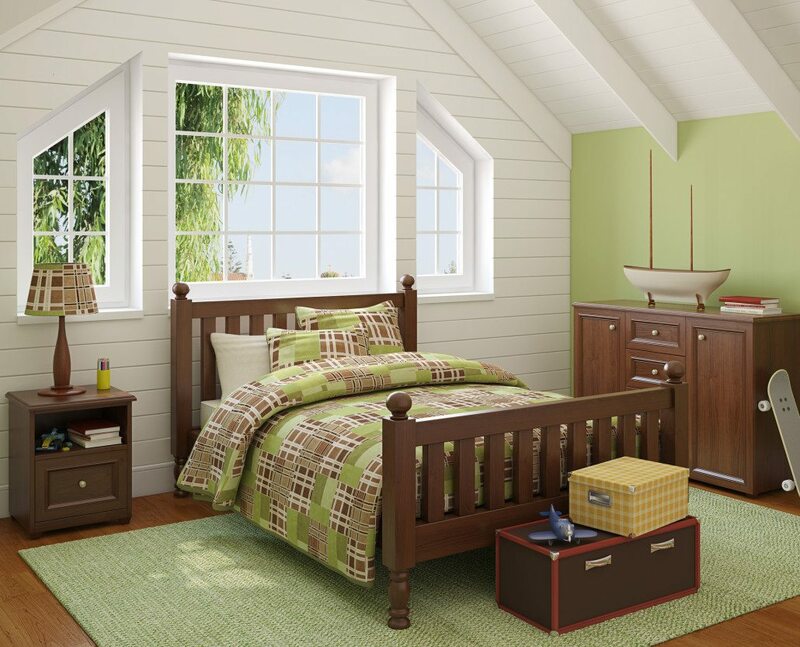 Save the environment by checking out local consignment shops once you are ready to buy your bedroom furniture. You can get furniture that is almost brand new for a superb deal at local stores that sell items from model homes. You can also visit local fabric shops for leftover material scraps if you want inexpensive do-it-yourself pillows or curtain panels.